You can iron Boy Scout patches on instead of sewing them on, and as long as the backing seals properly you will not have to worry about them falling off when the uniform goes through the laundry. Some Scout masters require Scouts to sew their patches on, but even if the patches end up having to be sewn around the edges, ironing them on will secure them in position before sewing. To make sure you get the patch in the right spot, check the Boy Scout handbook for correct placement of the patch before ironing. Preheat the iron to the hot setting. Check the garment's care label to determine the hottest setting the fabric can withstand without melting. 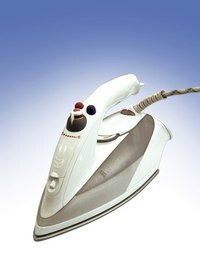 This is important because a warm or medium heat iron will not provide enough heat to melt the backing so it fuses with the fabric. Wet the pressing cloth with water, and then wring out the excess water so it is not dripping. The damp cloth will help prevent scorched fabric. Spread the damp pressing cloth on top of the patch, then press down firmly on the patch with the hot iron. Move the iron from side to side, but use only a slight motion so the iron remains over the patch. Keep the iron over the patch for at least two minutes. Remove the pressing cloth, and let the patch cool completely before you move the garment.